A Construction and Demolition Materials Management Plan (CDMMP) is a form to assist applicants in planning C&D recycling efforts. This form is collected prior to building permit. Do I have to fill out a CDMMP? There is no longer an administrative fee, however, you must supply a deposit for the project. The deposit is calculated at 2% of the highest valuation or $15,000, whichever is less, for a construction project and 10% of the highest valuation or $15,000, whichever is less, for a demolition project. The deposit may be made in the form of cash, check, credit card, or letter of credit. If you choose to submit a letter of credit, please request a letter of credit template to provide to your bank and allow for extra time to process. Both the deposit and the approved CDMMP must be received by the City before a building permit may be issued. How can I dispose of my waste? You have two options to dispose of your waste. First, you may use one of the City’s franchised haulers to provide a temporary bin. You may also self-haul your waste to certified C&D recycling centers. To find C&D recycling centers in our area, please search the CalRecycle database. Once your project is complete, you will need to provide diversion reports to Environmental Services staff. 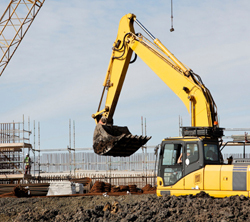 If you chose to have a temporary bin or rolloff box at your project during construction or renovation, simply ask the hauler for a diversion report for your project. If you chose to self-haul your waste, you will need to provide weight tickets from each trip to the recycling center and/or landfill. You must also provide verification that the materials were in fact diverted. Please make sure the diversion report includes the correct project address and project name. Once those reports have been provided and staff verifies your diversion percentage, you will receive your refund check in the mail within approximately 3-4 weeks.